The LPGA its not, but Golden Tour has that golf course feel that an online casino for ladies slot machine game based on golf should have. There’s no caddy for the gambling woman here, sink the putt with Lady’s casino by matching up shoes, flags, ducks and more. 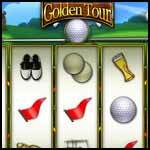 Swing to win with Lady’s casino and Golden Tour. Who needs a golf coach? Well, maybe it would be nice to have one for other reasons, especially if he's cute. But ladies, all you need to do in this 5 multiline slots game is to make a hole-in-one and get that winning symbol combination! At Lady's casino, we make it easy to get on the LPGA tour – and the path to success!